From what I can tell, it looks like a hardware unit with a detachable microphone and miniature cartridges like the Camerica Aladdin unit designed by Daewoo. It also has an FM sound chip inside of it. The software was designed by Open Corp; the same people who designed Buzz and Waldog. I had a brief conversation with "sinfox04" but he does not speak much English and doesn't have much interest in parting with his unit. Anyone else have more information regarding this product; or have easy access to Korean markets? And yes these things are hard to find plus expensive, even in Korea. There's another, way less known Karaoke cart by a company called Hicom. Here's the PCB of that, if anyone is curious. Last edited by MLX on Sun Feb 18, 2018 11:06 am, edited 1 time in total. Fantastic news! Hrm... Those pictures aren't high-resolution enough to make out what's inside of them. :/ It also does not appear to look like the unit? Well... The goal is to get the whole thing emulated. I was considering the fact if it needed to potentially be destroyed for science. Hopefully if we get better pictures and you get your hands on it, you can also figure out the mysteries. Do we know the total amount of extension carts and which ones there are? I mentionned this was the other Karaoke cartridge that was released in Korea. Much smaller cartridge and has 3 times the number of song. Also less popular because it came from a smaller distributor. As for the Daou's one, there are 4 known ext carts. Last edited by MLX on Sun Feb 18, 2018 11:07 am, edited 1 time in total. Hrm... Interesting. So I'm not familiar with this other cartridge then. Destruction is obviously not the goal, but some chips cannot be dumped by desired means. I was just planning for "just in case." Very interesting though! Is it the same program? What? I mean, I can't RE it just from these pictures, but it's not because some of the part numbers are illegible. I can certainly take educated guesses at what's going on—e.g. the GD4066 probably allows for software-adjustable volume control of the microphone. But the real problem (to me) is that I can't see the traces that are under the ICs, especially the DIP ones. Dumping the chips won't be enough anyway, I'm positive this operates on a unimplemented mapper so you'd need to do hardware & software RE. So your best bet to get it dumped and emulated would be a person used to such items. Add to that the necessary update to the emulator to provide mic input directly to the game as it expects it. Not an easy task by any means. And no, it's a completly different software. I do have a kazzo but I haven't done any attempt at dumping it because it obviously won't work on any common mapper (and it's the only Famicom game from this company so it's likely a singleton mapper). I can take HD pics of the PCB if anyone needs/wants them. But I won't desolder any chip by myself. I can also try to follow some traces with a multimeter but I got no time to do that at the moment. OK... Well this is a secondary "Noraebang" item; and it's of interest as well, for sure. Yeah! Might as well give us some more HD pictures of the cart and casing. That would be nice. Do we know the name of this cart, the software maker, and hardware maker? Kazoo dumper or TapeDump may do the trick if we can figure out the mapping from pictures. Otherwise CopyNES is also a good solution. 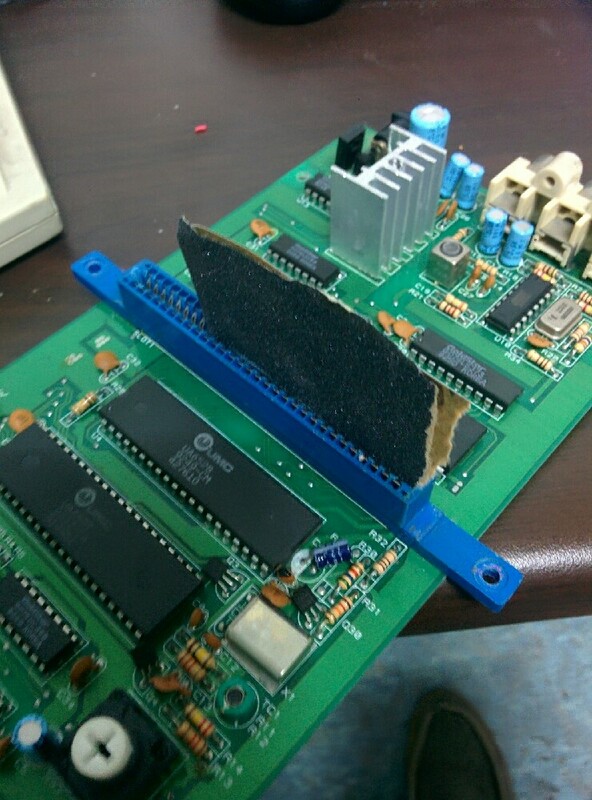 My personal interest in the Daewoo cart is finding out the FM chip inside of it. I'm not singing on the video but you can hear me blowing in the mic like an idiot ( ) at the very end of the recording. The audio output is fairly nice tbh. Seems like this is a boolean sorta switch thing... The mic can tell whether or not air pressure is applied, then the signal is supplied to the cart. To emulate this we'd just also need to know which register value the mic is mapped to. Doubt it's the same as the Famicom mic? In regards to dumping 까치와 노래친구 we would only need to dump the PRG and CHR ROMs. No destruction would be necessary. It was UOROM, thanks to NewRisingSun for the support. Now if it is possible or not to figure out how to feed the ROM with the microphone input it expects is another question. Let's debug it. PM me with details. Looks like it's reading two different addresses and comparing them... It's reading from $6000 and $6001. (These are likely the Mic (Force/Volume) Input values. Not sure why it needs two just yet...) Did most of the debugging with No$NES. To emulate this, we'd have to figure out the hardware of the mic input and the values that are stored/read. I'm not the greatest at hardware, but we'd have to trace hardware address $6000 and $6001 to the cart, see what it's connected to, and maybe look up a datasheet on those components. Looks like bit 7 of $8000 is also mic enable? The game is a 512KB UxROM. CCFD AD 00 60 LDA $6000 // load mic input (a) byte? CD10 AD 00 60 LDA $6000 // load mic input (a) byte? CD23 AD 01 60 LDA $6001 // load mic input (b) byte? CD2F AD 00 60 LDA $6000 // load mic input (a) byte? CD4A 8D 00 80 STA $8000 // bankswitch?